In a recent meeting ACA Board Member Kevin Sell asked a good question, "Why don't we ever have an article in our newsletter telling everyone about what we have accomplished?" He is right. While each year we send to the HQ of each group a request for listing information, and hope the group representative also joins or renews their group as a Member, and we provide a nice list of our most significant accomplishments, we haven't really told the many readers of our newsletter about them. So we will provide an article below that includes our yearly renewal letter and an updated list of accomplishments so you too can hear about just what it is that the ACA volunteers do. As you might imagine, most of those accomplishments were NOT easy to attain! Behind each is a story, often a story stretching over years and involving ACA volunteer directors and the volunteers and leaders of various groups. In many cases one or more groups have devoted significant funds or in kind contributions of staff time and resources to make things happen. This is all done to fulfill ACA's purpose: bringing the groups together to collaborate in enhancing the freedom of all volunteer pilots and their groups in flying to help others, to conduct their flights safely, to promote the charitable good work of all those involved, and to act as a common voice advocating on behalf of public benefit flying. As you read through the letter and list please think of how your flights, your volunteers, your group, and the patients and communities you serve may have benefited from the work of all those who have volunteered to make all those accomplishments possible! The recent Air Care Conference in Blue Bell, PA once again reminded me of the great work that you are doing every day. We heard from many of you how your organizations are serving your communities through volunteer aviation and I continue to be amazed at the generosity, selfless dedication, and ingenuity of each of you as you rise to the challenges. I recently had the distinct honor of speaking at two fundraisers, one for LifeLine Pilots and one for Angel Flight South Central. I love going out and meeting the pilots and volunteers from the groups because you get to see the real passion these folks have for serving and just how sold they are on the cause of getting people to treatment. Whatever you are doing out there at the group level, keep it up! The enthusiasm I saw was infectious and you can't help but feel good about what you are doing at the end of the day. Many of you are aware that in 2010 and 2011 we worked closely with the Air Safety Institute of the AOPA Foundation to develop an online, interactive course specifically for volunteer pilot operations. This was on the heels of a trio of accidents in 2008 in the volunteer pilot community and the subsequent National Transportation Safety Board report on Volunteer Pilot Operations. One of the recommendations we negotiated with the NTSB was to develop a safety course that would speak to the normal safety issues but also to the psychological issues involved with a "mission" mindset. Since the introduction of the course in October of 2012 more than 6,500 pilots and volunteers have gone online and completed the course. That is almost 300 per month! The Air Safety Institute has indicated that this is one of the more successful courses they have ever developed. If you know of pilots and volunteers in your groups that have not taken the course, please encourage them to do so and make it part of your group's initial pilot indoctrination. I am confident that this course has gone a long way to help our pilots reduce the self-imposed risk for these flights and has heightened awareness of the serious nature of what we do. Thank you all for your efforts in making this course so successful. Thank you all for your enduring support of The Air Care Alliance and what we are trying to accomplish. 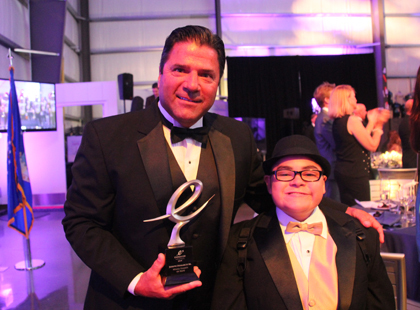 Three volunteer pilots, each representing organizations that are Members of the Air Care Alliance (ACA), were honored at an inaugural gala event, the Endeavor Awards, initiated by entertainment industry executive, Mark Wolper, award winning producer, director, and volunteer pilot. The event was organized by ACA member Angel Flight West (AFW) and held on May 4, 2014 under the glowing presence of the US Space Shuttle Endeavour in its new home at the Samuel Oschin Pavilion at the California Science Center in Los Angeles. Endeavor award recipients included Joe DeMarco, Sr., Volunteer Pilot and Founder of Wings Flights of Hope, Joe Howley, Volunteer Pilot and Co-Founder of Patient Airlift Services (PALS), and Jeff Hendricks, Volunteer Pilot for Veteran's Airlift Command. 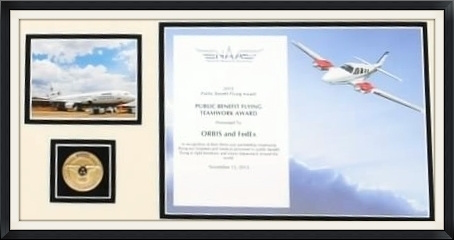 Each award was presented by individuals whose lives were changed in significant ways because of the flights provided to them by each of the pilots. "There were many new faces at the gala", said DeMarco, "event participants who were not aviators were able to meet some of the people we serve. They learned about volunteer flying and what it's all about." In addition to many aviation luminaries such as Bob Hoover, Clay Lacy, and John and Martha King, Wolper invited colleagues from the entertainment industry to inspire motion picture and television support in raising national and international awareness about public benefit flying. Jeff Hendricks stressed the importance of the award in building awareness in the aviation community. "The Endeavor Awards also serves a purpose, to let other pilots know of the volunteer flight organizations and the many opportunities to donate their plane and pilot skills; especially for our deserving wounded warriors and their families." And Joe Howley emphasized to attendees the importance of the country's 5,000+ airports. "Most people are unaware of the value of most of the airports volunteer pilots use and fly over every day." Two academic medical centers, University of Washington (UW) Medicine and UCLA Health Systems were also event sponsors. When asked about what to say to other healthcare institutions about public benefit flying, UW's Chris Martin noted, "they need to know the potential is huge... UW Medicine and Seattle Children's Hospital serve a very large geographic area and flights provided by AFW pilots are critical, especially for patients in rural areas that lack medical centers with quaternary care." "Mark Wolper invited us to participate," said Johnese Spisso, Chief Health System Officer at UW Medicine, "we are interested in developing more partnerships for volunteer flights." When asked about the Air Care Alliance, both DeMarco and Howley noted the potential value of having a central link between the public and volunteer pilot groups. "ACA has helped people find their way to us," said DeMarco of Wings Flights of Hope, and "It is rewarding when we are able to serve a patient's needs by linking with other volunteer pilot groups." Howley noted there were some increases in referrals to PALS from ACA, and emphasized the importance of looking at the long-term and the need for strong promotion and outreach to increase the number of volunteer pilots and aircraft to support future demands. 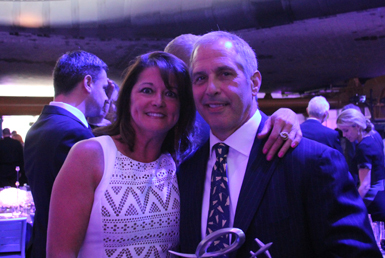 Rol Murrow, ACA Chair and Co-Founder, was also a member of the Endeavor Award Host Committee. 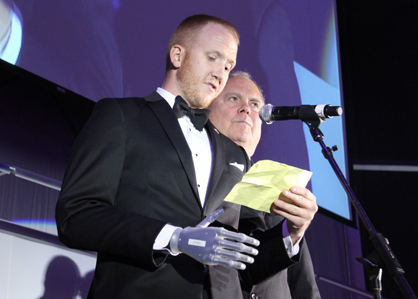 Highlights from the gala including a wonderful short video are available on the Endeavour Awards website, and organizers said that planning is already underway for 2015. For more information: www.endeavourawards.org, www.wingsflight.org, www.veteransairlift.org, www.palservices.org, www.angelflightwest.org, www.aircarealliance.org. In 1990 more than one hundred representatives of twenty-five volunteer pilot groups met at AOPA headquarters to share ideas. Out of that meeting came the Air Care Alliance, and since then, working with you, we have continued promoting, supporting, and representing public benefit flying. During this time we have made great strides improving all our organizations by encouraging communication and cooperation among volunteer pilot groups whose members fly to help others. I invite you to review some of the highlights of our accomplishments in the attachment below. Each year we ask that ACA members and non members alike update their referral information. Having current contact and service area information is critical in serving the public who needs you and your volunteer pilots, and in making sure your group receives appropriate referrals. You can view your current Listing here. Please look over your information on form we sent, change or add to it, and return it as soon as possible. NOTE: Your listing does not require any fee or Membership in ACA. However, many of you have been Members of the Air Care Alliance for many years. To you we say: "Welcome back for another great year!" We are delighted that you have chosen to continue supporting our ability to help you and all those who fly to help others. For those who have not yet joined us, we are pleased to offer you and your volunteer pilot organization the opportunity to join ACA as a Member, and to thus enjoy sharing your achievements and concerns with others who believe general aviation can serve well their communities and those in need. Add your voice to ours and help us present the 'Big Picture' about public benefit flying on the broad, national canvas. By doing so you will help not only your group, but all those served by all groups, and the volunteer pilots who wish to help them. In closing, just as you extend your hand and ask others to join you in helping others, so we extend ours to you and ask you to please join us as an Air Care Alliance Member organization and thus show your support for all those who fly missions of service. In addition to submitting your group's information update form, please add your request for membership, sign the form, and send it in with the nominal dues. It's probably the best investment you and your group will make all year! Now read about just some of ACA's accomplishments made on behalf of you and your group! Over the years ACA has attained many objectives, hoping they will help you in your and your group's work. Referrals and Promotion: Our website www.aircarealliance.org is heavily used as a resource by organizations and individuals seeking the services provided through the groups we list. We recently released a completely new site with automated referral capabilities to better serve those in need. Using the information you provide us, clients can send automated inquiries, make calls to our toll-free phone number, and send us emails so that those in need can be quickly connected with groups like yours. That's why our having your updated information is so important. Annual National conference: The Air Care convention serves as an open forum for our frank discussions of issues impacting our groups and all our volunteers' work flying for the public benefit. Since 1990 we have discussed topics that included insurance and liability concerns, the regulatory environment, safety programs, fundraising techniques, how to develop emergency preparedness programs, intergroup linking, and up to the minute administrative techniques to help make the work go more smoothly. And we all have fun and get to develop great friendships with other leaders! Representation with Government: ACA representatives have provided information and testimony to regulatory and governmental agencies ensuring they understand the capabilities and roles of those flying to help others. ACA has provided groups and pilots appropriate recognition and treatment in rules regarding aviation and nonprofit organizations. In the 90's we were successful in preventing attempts to stop charitable tax deductions for pilots' expenses. ACA representatives also argued successfully in Washington D.C. against proposed Air Tour regulations that could have crippled pilots' ability to fly charitable missions. 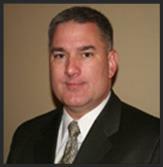 ACA continues work on the issue of fuel reimbursement and has already achieved some success. 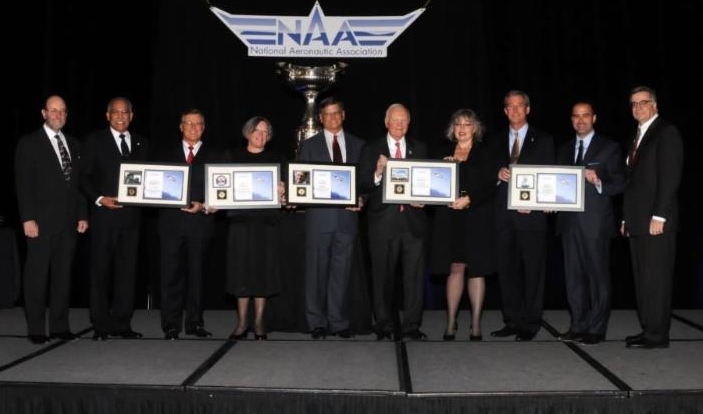 National Awards: Working with the National Aeronautic Association we have created an enduring set of national awards, presented in the U.S. Capitol Building and other DC venues. In this way we celebrate the accomplishments of public benefit flying volunteers and their groups, thus highlighting this work before Congress, aviation leaders, and the public. Endeavor Awards: This year ACA served on the Host Committee and promoted the first-ever gala Endeavor Awards on the West Coast, organized by celebrated Hollywood Producer Mark Wolper and designed to bring to the attention of the entertainment industry and media the wonderful work performed by the volunteers and groups involved in public benefit flying. Media Relations: ACA enjoys an excellent relationship with aviation and general media outlets, and refers reporters to individual groups so their stories can be told. AOPA and ACA also collaborated on a successful media outreach campaign. Safety Initiatives: The AOPA Air Safety Foundation and ACA first collaborated in the development of a safety guide for pilots and a companion video, distributed to all volunteer pilot groups in 1999. More recently, following several accidents that were investigated by the NTSB, ACA took a proactive stance and worked with the NTSB to enhance safety. The AOPA Foundation's Air Safety Institute worked with ACA and its Members to develop an excellent online safety course geared specifically for volunteer pilots and charitable operations. Safety continues to be a main topic at our Air Care conferences and we hope all groups keep this as the highest priority in their work with their pilots. International Public Benefit Flying Call Sign COMPASSION: In 1998 ACA worked with the FAA in Washington to draft procedures and institute an international ICAO call sign. COMPASSION may be used by all pilots in public benefit flying groups to indicate to air traffic control that they are flying patients or performing a public service mission. These procedures were the first ever to be developed, and have been used as a template by others. Representation at AOPA, EAA, and other events: ACA has regularly staffed exhibit booths or presented seminars at major aviation events, such as AOPA SUMMIT and the special 'Fly4Life' set of events at EAA AirVenture. Developing Fellowship and Consensus Among Group Leaders: Through the Air Care conferences and our other initiatives we have developed our members' joint consensus and brought it to the attention of large aviation associations, government agencies, our elected officials, and the general public. ACA seminars and literature reflecting our first-hand knowledge of the best practices and strategies are being used by various groups around the country, assisting their members in carrying on their good works. Helping any group work better improves the results for all groups and their volunteers. Nominations Due Now for the National Public Benefit Flying Awards in our Nation's Capitol! Send Yours by July 31. These prestigious awards are presented annually in Washington DC to honor those who have made significant contributions to the Nation through their involvement in Public Benefit Flying. In 2013 more than 250 leaders of national associations, agencies, and aviation companies attended and enjoyed the event. Created by the Air Care Alliance (ACA) and the National Aeronautic Association (NAA), the awards recognize and promote the outstanding work of the individuals and organizations engaged in this humanitarian activity. Please do take a few moments and honor a great contributor to Public Benefit flying by preparing your nomination! Public Benefit Flying Organizations or individuals may submit nominations for one or more of these awards by following the instructions on NAA's nominations page, which also provides the full criteria for each award. AOPA, EAA, and Other Events are Places to Show Off! ACA would like to remind all our Member groups that there are many great opportunities to make presentations, set up exhibits, and otherwise tell the aviation community and the public about the great services being performed by volunteer pilot and other charitable aviation groups. Please be sure to think about whether your group could attend and participate in these events. Of note are the various well-attended AOPA fly-ins being held around the country, including Spokane, WA August 16; Chino, CA, September 20; and Frederick, MD October 4. For info on each fly-in click here or for questions contact Dan Justman at 301-695-2182 301-695-2182 or email at dan.justman@aopa.org. AOPA is always very supportive of charitable aviation! EAA AirVenture in Oshkosh is coming up fast, July 28 - August 3, and it is likely too late to arrange presentations, but do keep it in mind for Summer 2015. In the meantime consider presenting at one of the many EAA Chapter Fly-ins and events. See their extensive calendar here. And also consider Sun n Fun in Florida in the Spring. A new event is the 2014 Aviation Summit, October 31 - November 2 in Palm Springs, California. Lift Event Management is organizing the event, which mirrors the prior AOPA events in that venue. A steeply discounted exhibitor rate of $750 - about one third the regular rate - is being offered to the public benefit flying groups, and includes booth furnishings. Visit the website at www.aviation-xpo.com for information, and contact Ken Bacon, Sponsor & Exhibit Sales Manager, to make inquiries, at email ken@lifteventmanagement.com or 339-221-3276 339-221-3276 - Mobile or 702-944-9683 702-944-9683 - Office. 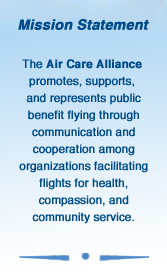 The Air Care Alliance lists and makes referrals to all the groups we can find. If your volunteer pilot organization is not on the Air Care Alliance Listings Page, please send us your information so we can include you!